This post was originally published in 2011 and updated on February 26, 2019. Whether you’ve been told to team teach or just find yourself in an organic partnership with a teacher on your team, you might be wondering — what is the best way to approach team teaching? 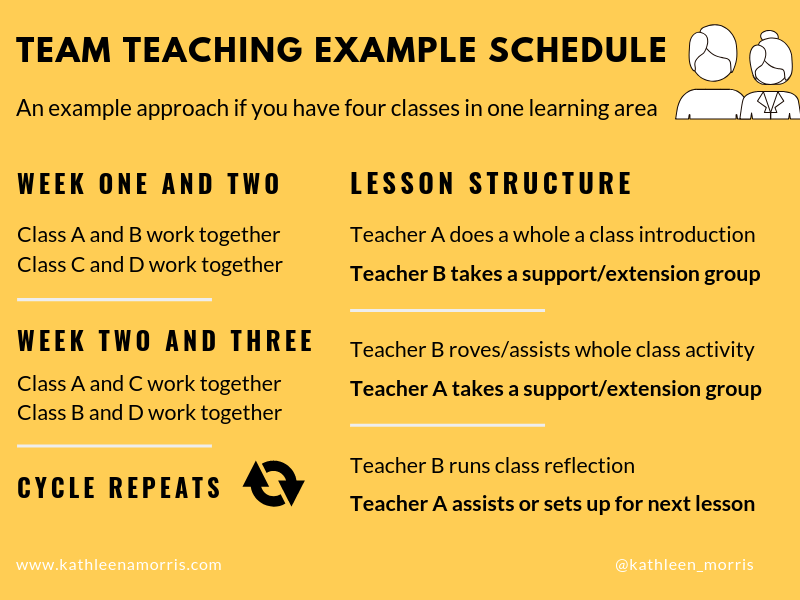 You have double the amount of students, (hopefully) a larger space to work in, and two creative and passionate educators but making team teaching work can take practice and reflection. This post goes through some tips for team teaching in the classroom. I also explain in detail my initial approach to team teaching back in 2010-2013 and a more current approach (2018/2019). Traditionally the school model involved one teacher planning for, teaching, and assessing one group of students. Like many things, it’s only when you question why this is the status quo that you begin to wonder if it is the best approach. Is this the best way to meet the needs of the students and move them forward in their learning? Is this the best way for teachers to grow as a professional while enjoying their teaching role? Maybe not. Here are some of my own tips for embarking on a team teaching relationship. I’d love you to share your own ideas and experiences in a comment. 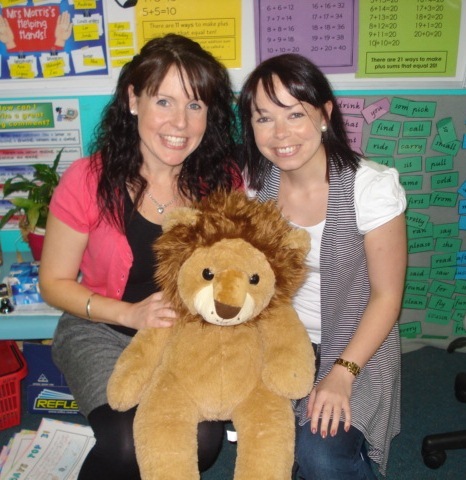 I began primary school teaching in 2004 and quickly befriended a fellow graduate, Kelly Jordan. Kelly and I had a similar teaching style and a similar work ethic. We began planning together closely and a few years later when our physical environment allowed, began team teaching. Team teaching is something we found to be hugely successful and rewarding. In this post, I will explain how it worked for us. Later in this post, I have written about a 2018/2019 approach that is working extremely well! Kelly and I worked in a large open classroom which was basically two classroom with folding doors that stayed open. There were a small number of classrooms with this set up in our school. We had a small withdrawal room which we used regularly for different groups and activities. We also had a number of special needs students who often required one-on-one support, so support staff took advantage of this quiet space to work with these students. Kelly and I were lucky to have two interactive whiteboards — one in each classroom. (Lucky at the time. Nowadays it would be so hard to teach without some sort of screen!). We alternated which interactive whiteboard we used for our introductions and usually had both in operation during small group work. In 2011, our tech consisted of 20 netbooks and an iPad (one!) in addition to 10 desktop computers and four iPod Touches. Remember them?? At this time this amount of technology was amazing and we used these tools constantly! For administrative purposes, we had two separate classes (2KM and 2KJ), however, we worked together for every session except for two hours of the week when one class was at a specialist class (e.g. Art, Music, P.E.). Like all classes, our students had a mixture of abilities, needs, interests, and personalities. There were 22 students in each class who are all aged seven or eight years old. Kelly and I planned everything collaboratively. This usually (officially) began early in the week when we sat down and discussed what our students needed to work on. We’d then draft out a plan for the following week. During this planning time, we wrote down many of the things we had been discussing informally as we had been observing and working with our students. From there, we’d often share out tasks and source different resources and activities separately. For example, I might look for some reading activities and Kelly might look for some maths resources. We then get together and discuss what we’d found, tweak our ideas, and finalise our planning. We had three hours per week of specialist classes which also provided time release for teachers. Kelly and I had one of those hours to plan together. The rest of our planning was done before school, online at night, and at lunchtimes. The planning process never stopped and we were continually teaching, assessing, reflecting, and planning. It was an ongoing and efficient cycle. We begin each day by marking the roll separately with our classes. This was a great way to connect with students and there would always be a daily question or the chance for students to share some news. We’d then join together for blogging, then literacy, and then the rest of our program. The first 10-15 minutes of the day was the only time we’d work separately. Kelly and I did most of our whole class teaching together. Our introductions and explanations bounced off each other and almost seemed scripted at times! Contrary to what some people asked in the past, it was certainly not ‘tag-teaching’ where one person teaches and the other person rests! Following our whole class explanations, we alternated teaching small groups or individuals separately. This provided real advantages for meeting students’ needs as the children could be grouped together in a flexible way. Our class blogs were a huge part of our program. In 2010 we had two separate blogs, however, we found it much more efficient and effective to have one joint blog in 2011. This also had the advantage of cutting down the workload for Kelly and me. Every day we started with 20 minutes of blogging and also worked on the blog at other times during the day. A day without blogging would be unheard of. Read more about that here. 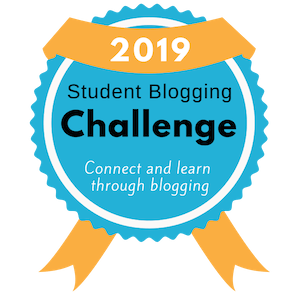 Our blog was a way for our students to improve their literacy skills, collaborate globally, connect with parents, learn about internet safety, work for an authentic audience, and develop the classroom community, among other things. In 2KM and 2KJ, we loved blogging and it opened up the world to our young students. Our students didn’t just learn from their teachers and classmates, they had children and educators from all around the world who impacted on their development daily. My opinion is that our team teaching was hugely successful. Kelly and I felt like our students’ learning outcomes were greater overall when compared to when we used to teach separately. Most people would agree that in order to continually learn and improve, individuals need to engage in regular reflection. This includes teachers. Team teaching allows for such rich reflection almost every hour of the day (and night!). 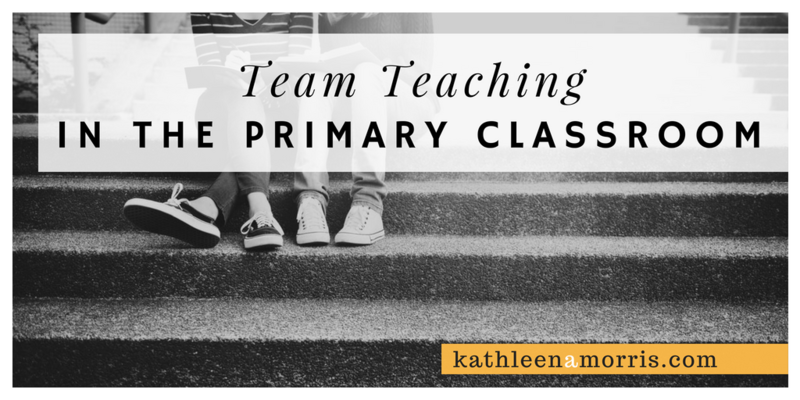 When we were not teaching, Kelly and I found ourselves talking non-stop about what our students needed to work on, what ideas we could use, and how our teaching was going. Our ideas just seem to bounce off each other proving that ‘two heads are better than one’! I simply can’t compare how valuable team teaching is as opposed to teaching individually and working in a grade level ‘team’. Discussing my students with someone who is never in my classroom rarely worked for me — the inside knowledge and vested interest just wasn’t there. Kelly and I were still part of a great team and it was fantastic for sharing general ideas and strategies, but for specific, individual professional dialogues, I preferred to talk to someone who was in my classroom. I think the main reason our team teaching was so successful was our compatibility. I don’t love the idea of putting two random teachers together and telling them to team teach. Kelly and I chose to embark on our collaborative teaching approach. We had very similar views on discipline, organisation, work ethic, student expectations, teaching philosophies, and even smaller things like noise tolerance and how we liked our classroom to look. Our partnership was harmonious and productive. Obviously, we are not clones of each other and despite many similarities, our personal strengths in different areas also complemented each other. I believe this helped to provide a rounded education for our students and we learnt from each other. Our students responded extremely well to our team teaching situation. 2KM and 2KJ developed a great community atmosphere with students having the chance to work with a wide range of their peers. At the end of each year, we surveyed parents about having their child in a team teaching/open classroom. All parents responded positively and said that they felt it had benefited their child. We always felt that we’d be able to help our students achieve even greater success if we had more time! Kelly and I are no longer working at the school we were at in 2011 when this post was originally written. I’m currently on family leave from full time teaching and am doing some casual/part-time teaching in a school with an extremely effective team teaching model. Due to a luxuriously modern/flexible layout, there are four classes in one big building. Rather than having set classroom spaces, the four classes team up with one other class for a two week period. Throughout each term, they rotate which class they’re working with. So, Class A will work with Class B for two weeks while Class C works with Class D. Then Class A will work with Class C, while Class B is with Class D, and so on. The whole day is spent together including marking the roll etc. For each lesson, one teacher will generally take the whole class introduction, while the other teacher will take out a small group for a modified introduction. This might be a group who needs extra support or extension. While the main group then works on their activity, one teacher will rove and assist, while the other teacher takes another small group to work on a specific learning goal. The class will then come together for reflection sharing. This might be led by the two teachers, or one might set up for the next lesson. This model is extremely flexible and adaptive to the students’ needs. It’s similar to the approach I initially adopted years ago, however, the withdraw of a group during whole class introductions is a powerful addition. It’s also ideal that the whole cohort of teachers and students are involved. The students’ progress has been amazing and I’m really enjoying being part of this model. Have you been involved in a team teaching situation? How did you find it? Do you have any other questions or thoughts on team teaching? I love the fact that you acknowledge how hard it is for teachers who are not necessarily compatible to force team-teaching. I’m in a teacher training program and when I teach, I am placed randomly with another student to co-teach the class. My teaching style is very different from my co-teacher’s and it’s been a rough road trying to deal with that. We have 5 classes left to teach this term and we may end up splitting responsibilities and only teaching half of the class time each. Have you ever taught with someone who you are not compatible with? Any suggestions? I know it is pretty common in some schools to throw teachers together and tell them to team teach. This is basically my worst nightmare! Of course some people might say you can develop as a professional by working with someone different but I can’t see how the kids will benefit is the partnership isn’t harmonious, complementary, balanced and desired. But of course you know all that! To tell you the truth, if I was in your position I would probably split responsibilities and teach half the class too. If the project was longer term then it might be worth sitting down and working out your differences but with 5 classes left I guess you just have to look at what approach will benefit the students the most. While I haven’t team taught with someone else, I have worked next door to people who I was hugely different from and it was very difficult. I have also worked nearby teachers who I was very different from but learnt a lot from (eg. people who ‘think outside the square’). It is hard, we need to model to our students that we are capable of working with a wide range of people, as that is what we expect with them. At the same time if we want to get the best possible outcomes for our students, we need to make the best possible decisions about team teaching arrangements. I’m in the same position; being forced to Team Teach with someone who is incompatible. The students hate it, I hate it and the other teacher thinks she is in charge because she brown-noses to the Principal class. All the teachers at my school have been told; “We’re doing this; get used to it.” No consultation, no choice and our opinions mean nothing. No wonder standards are dropping across the developed world. That must be incredibly frustrating for you. I really hope you can work out a solution to get by. Perhaps it would work okay if you could divide up responsibilities. Easier said than done. I know. Good luck! Thank you so much for this great post. You have answered many of the questions I had about how a successful teaching team operates. As you discussed, I believe that the most important elements of team teaching are being highly compatible with your partner. Trust and respect are also key elements – and obviously what you and Kelly share for each other. One question I have is how do you approach report writing? Do you each do your own ‘grades’ or do you collaborate to write each child’s report? Thanks for your comment. As I said, I’ve been meaning to write this post for a while! Yes, trust and respect and crucial. Without that, team teaching can’t really work. Kelly and I write our own students’ reports and conduct our own parent-teacher interviews. It would be nice to do interviews together but there just isn’t time. We also deal directly the with parents of our own students, however if one of us isn’t around, parents know they can speak to the other teacher. We do all our formal assessment on our own students to help with our report writing. While we write reports separately, we always confer with each other about results/comments; particularly if the other teacher has been working with the student regularly (eg. a guided reading group). I hope that helps. Do you have much team teaching at your school? We don’t have team teaching however I work very closely with the other Prep teacher. We share some activities but are really two separate grades. We plan closely together and share the same philosophies about teaching and learning. Team teaching could work for us. Lots of food for thought – thanks again. I really think your students will be benefiting greatly from the teamwork that you and Kelly have going on. I think it is great. Do you think team teaching could ever work in two adjoining rooms that don’t have a removable wall? A collegue and I have talked about the possibility of teaming up but are a little restricted by the physical layout. That is an interesting question. 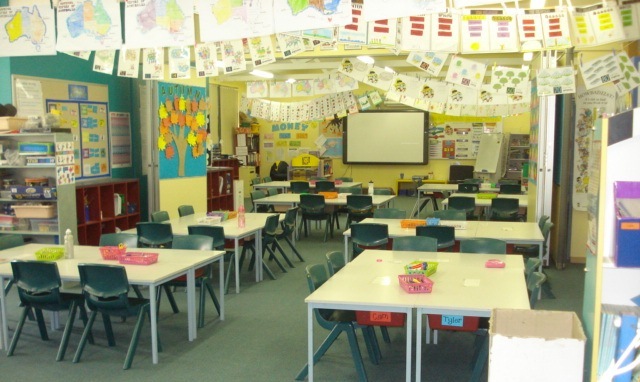 There are a only a small number of rooms in our school with the open set-up so Kelly have recently discussed if we think we could keep team teaching in two traditional adjoining rooms. While it isn’t ideal, I think we could make it work. We could do our introductions together in one of the rooms and then we’d have to rove between the two rooms while the children were working (assuming the rooms had some sort of connection like a middle room to walk through). Because of the benefits we’ve experience, I think if we had to work in traditional classrooms we’d try to make it work as best we can. Team teaching this year, its been beneficial for sure for me and the learners. We work well together but also have different teaching and learning styles and I think these different takes on the world give the students perspectives that I alone could not provide. Thanks for sharing your experience. I agree, the students really do get a much larger perspective by having two teachers. It’s great! I’ve already seen the success of your team in action due to blogging and tweets. Having been in the situation, I fully agree the most important issue when considering team teaching is compatibility. Each teacher has to be confident in the support of the other. I have seen teams work brilliantly as each teacher moves around checking on children’s progress. The team also allows individual or small group work while the partner deals with the larger group. Thanks for your comment. I did forgot to write about that really important benefit of having one person being able to take care of the larger group while the other teacher can focus on individuals or groups. We do this all the time and it really is a huge benefit. Thanks for pointing that out. Having two teachers is also great for those times when you come in after lunch and there are issues to deal with. One of us can teach, while the other can sort out the issues (not that 2KM and 2KJ have too many issues 😆 ). Teaching individually, sometimes the class had to wait for their lesson while problems were being sorted out. I was very interested to read your post because I work in a Year 1/2 Team Teaching class. My colleague and I did not choose to work together because when I came to the school I was put into this classroom. My colleague had been working for two years in the classroom with a teacher with whom she had no rapport or commonality, and she was very miserable. Thankfully, we get on very well and like you and Kelly share the same views on discipline, organisation, work ethic, student expectations, teaching philosophies, noise tolerance and how we like our classroom to look. It turned out that we went to uni together and had been teaching the same number of years. We both have children of similar ages (who went to the same high school). We do a lot of things together, but not as much as you and Kelly. This year I started the Daily 5 with my Year 1 group. We both did the CAFÉ strategies. My teaching partner has seen the benefits of Daily 5 with my group and plans to do it next year, which should make things more cohesive. You are very fortunate with the amount of technology in your room. We share an IWB and only have 4 (old) computers. However, I have just bought an iPad and an iPod which is very exciting. I agree with you about the reflection and bouncing ideas off each other. We really support each other. If one of us is a bit flat, the other will take up the pace. If one of us needs to deal with a small group or student situation, the other takes over. Like you, we also do our own assessment and reporting. Thanks again for your inspirational post. Thanks for your comment. Oh dear, I can imagine your teaching partner was miserable being told to team teach with someone she was incompatible with. I bet she’s glad you came along! In our first year of team teaching (last year) Kelly and I didn’t do quite everything together but now it is 100% (apart from our specialist) and we’ve found that works for us. Like you and your partner, Kelly and I graduated from uni at the same time and have been teaching the same number of years. That’s great you have got an iPad and iPod – you’ll love it! Yes, I know what you mean about one of the pair sometimes picking up the pace – that definitely happens in our room too from time to time. As Ross mentioned, team teaching is also great so one person can look after the group and another can work with groups/individuals. That’s definitely one of the major benefits. Thanks for this inspiring blog post! As a teacher-librarian, it’s a job requirement of mine to “partner” on at least one unit per year with every classroom teacher in the school. Every partnership is different, based on the dynamics of the two people involved. Some teachers aren’t comfortable giving up control of their class. Others feel awkward having a colleague see them teach. Thankfully these issues aren’t as common as when I first started team-teaching. Having said that, there are teachers that I work better with because we “click”. I used to work a lot with our special education teacher and we did some pretty magical things together (if I do say so myself), but this year, she has a new position and is no longer at my school. I must admit that I miss her a lot and we both miss working together because our brainstorming was richer between us. Will either of you ever leave your school? Would you consider following each other if you did? If one left and one stayed, how (if at all) would you try and initiate a new team-teaching partnership like the one you have? What a great experience getting to team teach with a range of people. I can imagine the reaction from some people but I’m glad to hear most are getting used to the idea. I bet you just loved those team teaching experiences where you ‘clicked’ with the other teacher. What a shame your special ed teacher left! I like how you said “our brainstorming was richer between us”. That is the way I feel too. Often, one of us will think of an idea and the other will build on it and so on. That is a good question about whether we’ll ever leave the school. While we certainly don’t have immediate plans to leave, I can’t imagine staying at the same workplace for the rest of my life. It would be nice to relocate together (if we ever did), however logistically I’m sure that is very unlikely. I would be prepared to team teach with someone else one day however I’d be very selective about who I’d like to make that arrangement with. I also think it’s good to work in a team with someone first and see how compatible you are before embarking on a whole new teaching arraignment. Take it slowly I guess. What a fantastic post. This is currently my first year of team teaching and I have found it to be the most rewarding experience professionally and also fantastic for our students. I am lucky to work with a fantastic teacher who is very similar to myself and has the same expectations and work ethic. We work slightly differently to you and Kelly as we are both responsible for all 50 prep children, which means that we write our reports together. This was something that we felt we needed to do. We both feel that our children are getting the best of both teachers. We both have different strengths, which is most beneficial for our students. We plan everything together and we have worked it so we both see every child each week in focus groups. We find ourselves in continual dialogue about our students and what we can do to move our children along as well as what we can do to improve our classroom environment as well as our own teaching. It was great to read how team teaching works in your room and to discover that it is very similar to ours. Thanks so much for sharing your experience with team teaching. It does sound very similar and I think it is great that you just have “one class”. We would love to do it this way but I don’t think it is possible from a logistical/admin view at our school. Do all 50 students go to specialist classes at one time? How does that work with just having one specialist teacher? Do you have to make time for 50 parent teacher interviews? I’m keen to hear how you make it work as I do think it would be great to do it your way! There was a lot of organisation at the beginning of the year to make it work as one class. We use the school sports colours a lot with our class so it meant creating 4 equal sports teams and the children go to specialists at the same time. So red and blue might be at library while green and gold are at sport. And then they would swap. It took a little while for everyone at school to understand how it would work (at the moment we are the only class team teaching full time) but it has worked. It has also meant that the children have benefitted socially as all of our preps know one another so when they move into a 1/2 class next year they know more of their class mates where as in previous Years they only new a couple of other children as our preps split into 4 grades for 1/2. We did have 50 interviews. At the February interviews we used the same night as the rest of the teachers and the other interviews we had before and after school over that same week. It was a lot and it wasn’t expected of us to have interviews that way but Andrea and I felt it was important that we both spoke to each parent. We were very fortunate for our interviews at the end of term 2 that our principal organised emergency teachers for us for the day of our interviews so we had our 50 interviews all on the one day/night. The only tricky part of our classroom is on the rare occasion when one of us has been away. 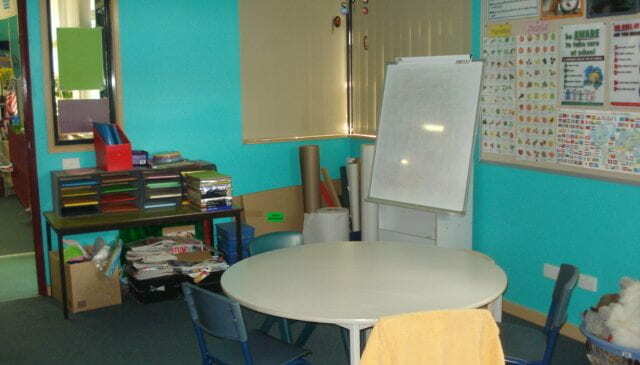 In this situation we have used our colour groups to break into two groups for some sessions with an E.T, or on other occasions we have continued our normal day team teaching with the emergency teacher. Thanks for the explanation. That certainly is a unique approach to specialist classes but it sounds like it works! I agree, I think the students really benefit from getting to know and work with a wide range of students in their year level. You are really lucky that your school supports you with this and how great that you had CRTs so you could do your mid-year interviews. That shows they really value your partnership. Being absent is tricky. Kelly and I used to try to team teach with the CRT but to be honest we felt that we were doing all the work and the CRT pretty much just sat back. It wasn’t really fair for the teacher who was at school. We now close our doors if one of us is away which is easy due to having two separate classes. It is actually nice to work with a small class every once in a while. Funnily enough, most of our absences this year have been when Kelly and I have presented together at conferences etc so we then just have two CRTs who taught separately. I enjoyed reading your post about team teaching! You are so fortunate to have a teaches partner who matches your teaching style and beliefs, with the physical space to make it all work. You have a dream come true. It would be really interesting to see you both continue with the class for another year. The growth could potentially be tremendous. I’ve also seen multiage classes where the higher year moved on and only 1/2 of the class changed. The success of your partnership is a real gift to your students! I agree it is a dream come true to have the teachers, location and school support to make the team teaching arrangement work. We used to have multi-age classes and I was teaching 1/2 so I just loved having the grade ones again in grade two. It was great! So nice to come back after summer to familiar faces and families and pick up where we left off. Thanks for a succinct, explicit and practical post. It often baffles me why teachers close the double doors! I love the team approach to teaching. How can we preach a collaborative learning model to the students if we don’t practice it?? Thanks to you and Kelly I was able to set up a collaborative blog this year with my team teacher Angella and her class. 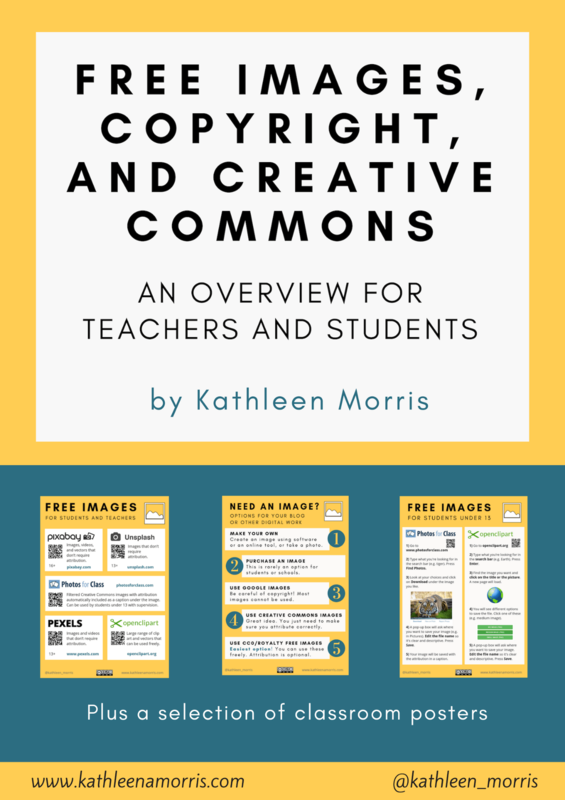 Two classes using and integrating with a blog makes so much sense. Reading your post was like looking in our mirror. Powerful, dynamic and a few ‘ah ha’ moments. Luckily for us we have been encouraged to take our class for two and in some cases three years. It has been phenomenal to observe the learning at the start of the year when traditionally term one is a ‘getting to know you’ time that seems to stretch out over the whole term! This year we got straight into learning day one and have not looked back!! 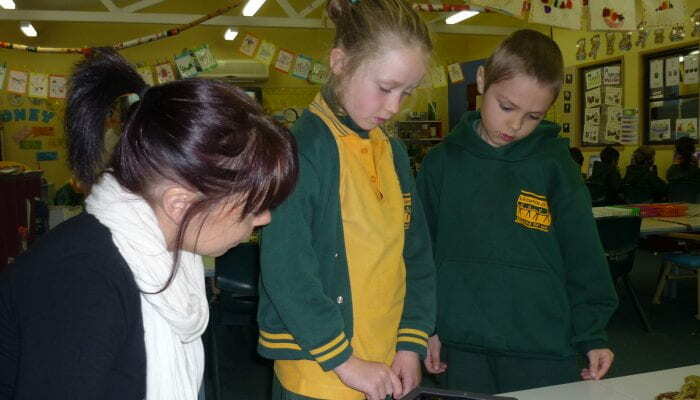 We have seen some powerful inquiry based units empower kids to soar and with the recent addition of the latest IT gagets into our classrooms (ipads, netbooks, document reader, ipods, new IWB’s) we have enticed and engaged every learner, at every stage, at every level and at every entry point of the curriculum. Our children are motivated to learn, see themselves as active participants in their learning journey and are excited to be at school each and every day- and isn’t that what it is all about? Thanks Kelly and Kathleen. Looks like you are a dynamic duo! Thanks for sharing your experiences! I agree, it is quite baffling why so few teachers are interested in team teaching. Very strange. Collaborative blogging has so many advantages so I’m glad you’re enjoying it too. I’m very envious of you being able to take your class for multiple years! I’m definitely interested in doing that. You’re right about wasting time in Term One. It just doesn’t make sense to me why we’d change students every year. You must be loving all your equipment! Hi Kathryn & Kelly, my situation sounds very much like yours. Wonderful journey for us both over the last 4 years. What I love is that we both know the students so well and the kids love that. They know they have 2 teachers and there is none of the drama of friends being split between classes. Like you we can’t stop thinking, dreaming, creating new learning experiences. Like anything, teaching is better with a friend I’m sure. Good luck to you both and long may the teamwork continue. Sadly for me my team is coming to an end but that’s exciting too with new challenges. I have heard about the wonderful partnership that you and Henrietta have. I’m very sorry to hear that your partnership is coming to an end! I hope you enjoy your new experience just as much. Thanks so much for sharing your experience with team teaching! Your post brings back very fond memories of co- teaching my 7th grade math class for two years with my colleague Johnsie. I taught 7th grade math for 13 years and for the last 4 years have been an instructional technology specialist in a high school. By far the highlight of my teaching career has been the 2 years of co-teaching! We were not asked to co-teach, rather we proposed it with our plan and model to the administrators. They willingly agreed. Like you and Kelly, we both were very compatible. Our disciplining, teaching and learning beliefs, and teaching methodologies were very similar. Most of all, we both were passionate about math (sometimes in a nerdy way) and our students saw this! The most amazing thing about us was that we often completed each other’s sentences. All of this definitely made sharing a classroom and a team of about 95 students really easy! Our weaknesses and strengths were a compliment to each other. One of the nicest things about co-teaching was how much we learned from each other. There was many a moment when I would be standing and listening to Johnsie explain a concept to students thinking to myself, “Oh yeah why didn’t I see it that way?” As far as the students were concerned, they always had two people to help them. Classroom management was a such a bonus with two people. EX: As one began class, the other walked around checking homework, making immediate contact with students that missed homework. We also shared grading of assignments/assessments, making sure we rotated the students so we both knew all our students’ work. Our lesson planning and discussions were rich and extremely beneficial to both of us. I cannot think of one negative thing to say about our experience. Of course, this is only because of the fact that we worked well together. Like someone else mentioned above, co-teaching can go the wrong way if two people that don’t see eye to eye are put in a classroom together. I was lucky to have shared the experience with a colleague who was a compliment to my teaching style. Thanks Kathleen for bringing back memories of my best teaching yeas! Good luck to you and Kelly and congratulations on a job well done! Thanks so much for sharing your experiences! Even though it was a different time, age group and subject area, the similarities are very strong! I agree, I just can’t see any negatives for team teaching (with the right person of course). It really does make teaching and learning easier, stronger and more enjoyable. I laughed when I read that you finished off your partner’s sentences. Kelly and I do that all the time. There is definitely some ESP there. Also, you’re right – Kelly and I always learn from one another when we hear each other explain things in different ways. I really enjoyed reading your comment and I’m glad you have such fond memories of your experience! It certainly sounds like a memorable time. Your team teaching post has definitely got me thinking. Jasmine wonders why teachers close the double doors, but clearly, working in an open area with an incompatible partner would be like a bad marriage! On the other hand, if you select your partner carefully,it may be a match made in heaven! Both teachers must share a similar philosophy and work ethic. I suppose the unflattering, ‘tag- teaching’ label comes from observing the less successful teams where one teacher seems to do the work while the other potters about. It’s wonderful when two teachers share the same philosophy and enthusiasm for teaching as you and Kelly. Being lucky enough to have ‘inherited’ your lovely class this year, I have seen for myself that what you are doing works very well. You surely deserve a great deal of credit for their wonderful attitude and enthusiasm for learning. I also like the idea of having students for more than one year. It would be great to ‘hit the ground running’ on day one! When we had levels, rather than grades, we used to keep half our class each year. While I believe that two heads are generally better than one, it’s the commitment, deep knowledge and enthusiasm of the teacher/s that truly makes the difference.The beauty of your arrangement is that it facilitates continual observing, reflecting and responding to student needs – and that’s the key. Yes, as I said to someone else, it would basically be my worst nightmare to be told to team teach with someone I was incompatible with. There are just so many variables to match up and you’re right that similar philosophies, commitment and enthusiasm is key! I’m so glad you’ve found my 2010 students as enjoyable to work with as I did. They certainly are a great group! I used to love teaching some of the same kids when we worked in levels. As I said to someone else, seeing those familiar faces on day one is just a joy. There is no wasted time. You know the students and the families and can simply pick up where you left off. I think we should push to do this more at our school! Unless there are any obvious clashes, it just makes sense. My district is in the process of designing a K-5 school that incorporates a collaborative teaching model. What would your ideal classroom look like? Would you have movable walls? Would you have separate classroom with one common learning area? Would you just have one large space? Would the classrooms be different at different grade levels Any insights would be appreciated. I enjoyed having one large space although that was only because I was working with the right person. I would hate to work in a large open space with a teacher who had a very different approach to mine. Good luck, I’m sure you’ll love team teaching! I know you are not teaching at the moment but I wondered if you could give me some advice on collaborative teaching with New Entrants and year 1. There are three teachers and approx 60 children. Two classrooms are very similar to yours, with folding doors but we have another classroom that is separated by cloakroom. We have tried to create a free flow area from the separate classroom and we are enjoying working as a collaborative teaching team. Our school is looking into MLP and modern learning environments. 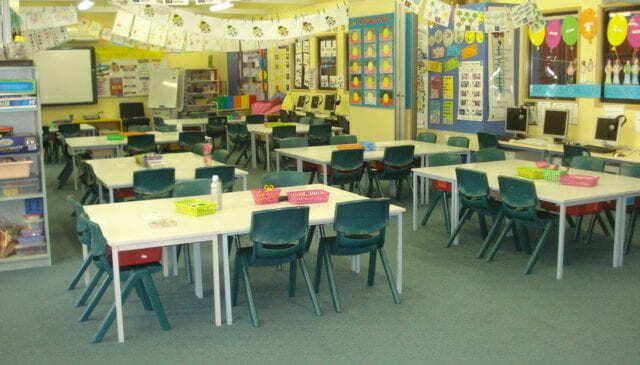 However, there is some apprehension amongst some teachers that the 1970’s style of open plan teaching is coming back. I don’t think this was necessarily ‘collaborative’ teaching. I was wondering if you have come across any quantitative data on the benefits of collaborative teaching? I’m sorry but I don’t have an quantitative day. My experience is simply anecdotal. I was lucky enough to be in the position where I could team teach with someone who had a similar style and similar standards to me. I’m not really a fan of being ‘told’ to team teach…it’s all about matching up the right teachers as far as I’m concerned. I’m glad to hear you’re enjoying your arrangement. That’s so important! I’m not sure how it worked in the ’70s but I have seen different versions of collaborative teaching. Clearly, having two separate classrooms operating without a wall isn’t collaborative teaching. Likewise, some versions of “collaborative teaching” involves tag teaching. Sorry I can’t be of more help. Perhaps if you haven’t already, you could ask on Twitter for advice/references? What a great idea! Thank you for your great blog and practical tips. Hi! I stumbled upon your site, found it on Pinterest and think it is awesome! On of my fellow first grade teachers and I want to pilot team teaching next year. We both love to try new things and really like the hands on learning approach. We are motivated to make this successful. How did you get started with this approach? Are there more teaching teams in your schools? How did you approach parents about this? Thanks so much for any information you can provide me with it will help this get up and running at our school! I’m so glad you stumbled upon my blog and found my post useful. This post was actually from 2011. I am not currently teaching at the moment as I’m on maternity leave so I don’t think I’m the best person to ask. Good luck with your team teaching! This post has been very informative and interesting. I have just been told I will be team teaching a primary 1 class in August. This will be my first class as I have just finished university and I was feeling a bit disheartened. I was so excited to get my own class and to be told it will be shared was a little daunting. I have not met the other teacher yet but hopefully our teaching styles match. If anyone has any tips on how to make this year as productive and fulfilling as other team teaching classrooms are then please let me know. Reading your post above is just like reading a scripted response from my partner in team teaching and me whenever anyone asks what we do when team teaching. This is now our 4th year team teaching. The only difference that I can see is that we mark the rolls together as one class even though they are separate rolls for admin. This year, however is completely different as previously we have been on Years 5 and 6. (We actually took a year 5 class into Year 6 and it was absolutely awesome.) This year we requested Kindergarten..from Year 6! We have adapted to the change of grade but we are just trying to get our head around morning literacy based groups with a massive ability range in the cohort. Some of our group came to us with no knowledge of how to hold a pencil or even which hand they preferred and some are reading and writing all of the tricky words. Any suggestions for how to organise rotations/groups that does not involve hours more work above the 60 hours that we probably already do and that caters for the differentiation required? I miss the days of team teaching with Kelly! It was a great atmosphere for everyone I think. I’m so glad to hear you’re enjoying team teaching in the same way. So funny you came up with such a similar model too! Good on you putting your hand up to go to kindergarten. I’ve actually been teaching a little bit of prep (kindergarten) this year and the team of 4 classes has been looking at the best ways to collaborate. A model they are currently working on which seems to be going great is to have two classes pair up. They’re doing their intro together then one teacher takes the group for the main activity while the other teacher pulls out a small group for either intervention/support or extension. Then after a few weeks they swap and work with a different class. They’re not currently doing literacy rotations as such, in the way that we used to do it. Is it a requirement that you have rotations happening? Maybe you could simplify things? I know it’s so hard when some kids bring very few skills and knowledge and others are already thriving. Such a range! -How do you minimize student distractions, particularly for kids with ADHD or behavioral issues? -How do you justify a large group (45 kids) being better for students who just don’t do well in large group settings due to noise or distraction or reluctance to contribute ideas? – I myself am sensitive to noise and movement. The thought of having 45 kids together in one double-sized, open classroom is very uncomfortable. What suggestions do you have for me and students with similar issues? 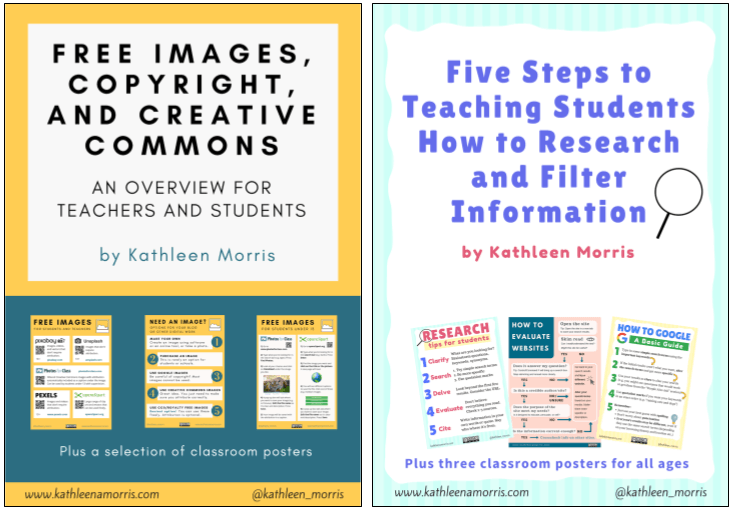 – Do you have any resources on team teaching to recommend- either books or videos or PD? I hope the post gave you some food for thought! I don’t think there’s a magic answer to this question. I think it’s just the same approaches you’d use in any classroom — consulting with parents, the student, and previous teachers to find out what the student needs and how they work best. Then trying to accommodate when possible. I know some teachers like having calm areas etc. My personal preference is a large teaching space with ‘nooks and crannies’ rather than a big open plan classroom but that’s not really something we can choose! I have pretty much just approached team teaching as a situation or opportunity I’ve been presented with and made the most of, rather than justifying or advocating for having a large group. Academically, I’ve definitely seen benefits for the students as they can be better catered for at their point of need. Once I got into the swing of teaching with others, I found it harder to teach by myself. As a teacher, you often seem to be making constant decisions all day long. It’s nice to be able to join forces with someone else to work out what is best for the students. I’m exactly the same — very sensitive to noise! So I’d use the same approaches I’ve always used in the classroom (of any size) to set a calm and considerate tone from day one. Hmm not that I can think of. Are you on Twitter? It’s my number one place to find answers to things like this! Happy to help you re-tweet etc to find more resources!